Although the hot, muggy weather continues to linger across Indiana, crisp fall days are on the horizon. With autumn comes cooler temperatures, beautiful colors and festive traditions. In the world of real estate, fall offers a new dynamic for home buyers and sellers. Get with your Carpenter agent and ask them to share their expertise to help you finally make the move to your dream home this season. “The spring real estate market is typically the strongest, but central Indiana right now is seeing rising prices and homes are selling quickly. I wouldn’t hesitate to take advantage of this incredible opportunity right into the fall season,” said Amy Englert, from Carpenter’s Carmel office. The strong central Indiana market, combined with low mortgage interest rates, could cause homeowners to believe anything will sell at any price. While it’s true that many people are out searching for their next dream home, sellers need to be in tune with what buyers want and are willing to spend. Nice landscaping helps sellers create a great first impression. In fall, take time to rake leaves and pick up sticks, nuts and other yard debris. Keep your landscaping in tip-top shape at all times. Keep the grass mowed and neatly trimmed to give your yard a maintenance-free look. 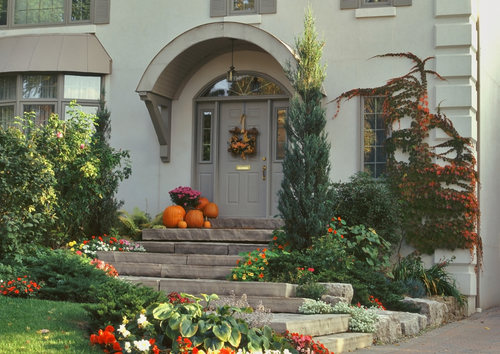 Add a colorful fall arrangement or wreath to the front door to welcome buyers and embrace the fall season. As fall grows closer to winter, incorporate more fall-themed displays along your walkway and entry. This will keep your exterior colorful and attractive, drawing buyers to your door when your landscaping becomes more lackluster. All throughout the year, sellers should strive to create a warm, inviting environment for prospective buyers. In the fall, this is especially important. As the weather allows, set a small fire in the fireplace to showcase this feature and evoke warm emotions during showing. Place soft throws on furniture with a mug and book nearby, creating a scene of warm afternoons and evenings spent curled up in comfort at home. Light a candle to add to the ambiance. “Pumpkin and cinnamon scents evoke feelings of comfort and coziness, so don’t forget to appeal to all of the buyer’s senses,” Englert said. Well-placed arrangements with fall-colored blooms and gourds bring the outdoors in. As with all other times of the year, sellers should keep the house clean and decluttered at all times. Sellers may wonder if fall and winter are not ideal times to market their home. Yet people are buying and relocating every day of the year. When the leaves are down, trees are bare and grass is brown or covered in white, sellers may struggle to show off their curb appeal. A smart solution is display photos of their home in spring and summer. A vital step in every home transaction is the inspection. Buyers should ensure they have a thorough home inspection performed by a qualified, experienced professional before closing on a property. In fall and winter, inspections present special challenges, which buyers need to understand. “Often, the inspector cannot check the air conditioning unit in the fall if outside temperatures are below 65 degrees. If there is frost or snow, the inspectors cannot always safely get on the roof to inspect it properly,” Englert said. Buyers can get peace of mind when some parts of the inspection are not completed by reserving the right to address deficiencies in the air-conditioning unit, for example, when it is turned on in the spring. Sellers may want to offer a home warranty with the purchase agreement to put buyers’ minds at ease. As an extra measure, sellers can have an inspection completed before fall and address any issues that arise. Then, buyers who walk through the home in fall can have confidence in purchasing the property.